Coming soon to a city near you, the Just Ask Mobile! VISIT OUR FUNDRAISER PAGE ON GO FUND ME! 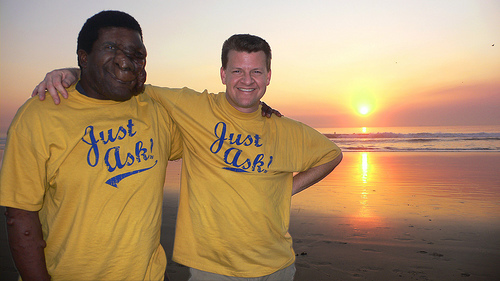 The Just Ask Foundation is currently in the process of planning a 2014 nationwide awareness campaign for neurofibromatosis. Our multi-targeted campaign will consist of speaking engagements in cities with NF Chapters, television appearances (locally and nationally), ad campaigns, fundraisers, road trips in the Just Ask Mobile, a social media team and, well, you get the picture. Wow! Those Are Some Really Big Plans! You are correct. But if we want big results, we need to start with a big plan. Will we accomplish everything on the plan? Maybe. Maybe not, but until we try, we’ll never know. But, in our mind, if we can make a difference in one person’s life, we will have succeeded. Big time! Sure, tons of them, but this one pretty much says it all. Earlier this year, we received a note from a young college student in Canada who had recently been diagnosed with NF. “It would mean the world to me if Reggie Bibbs would be able to attend the NF conference in Vancouver in October. Reggie is my inspiration, and I know you probably hear that a lot. But my story would be a whole lot different if I didn’t have the opportunity to meet Reggie a few years ago. She continued… “It has NOT been an easy journey for me. I’ve suffered from serious depression and a serious eating disorder, just because I was ashamed of who I was. I was ashamed for having NF, and I was embarrassed to tell people about my medical condition. All I wanted was to be normal, but to be normal I needed to shut out pretty much everyone from my life and live behind a curtain of fake emotions and fake stories. It wasn’t until I met and heard Reggie speak that I felt comfortable enough to come clean, and to finally accept myself for who I am. Ok, I’m Hooked! What Can I Do to Help? It’s going to take a little money. Not a fortune but certainly more than what we have in the bank right now which is about $514. Up until now, we have depended on the sale of Just Ask! t-shirts and a few donations here and there to make ends meet. Well, quite frankly, to accomplish our goals for 2014, it will require a lot more than a few hundred dollars. Our Fundraising Goal is $120,000. Wow, that’s pretty aggressive. Yes, it is, but so are our goals! Our plan is to target one major city a month via the “Just Ask! Mobile” for 12 months. That’s $10,000 per month for two people to travel cross country raising awareness of neurofibromatosis. Speaking to NF groups. Appearing on radio programs, talk shows…who knows, maybe even The Ellen DeGeneres Show. The point is we’re going to be working our butts off raising awareness of NF at every stop and every mile marker on the road. At every truck shop, motel, restaurant and rest stop across the country. Ok, ok, I said I was hooked!!! Can I donate some money? Click on this link and donate as much as you can afford. That’s it. You provide the tools. We’ll do the heavy lifting. Of course, the Just Ask Foundation is a 501(c)(3) so all donations are tax deductible! Plus, we will be posting on Facebook, Twitter, Flickr, Vimeo, You Tube and every other social media network we can access to keep you informed of our travels and adventures. We Are Thankful for Your Help! As you come together with your loved ones, this holiday season, please remember all of our NF brothers and sisters who may not be as fortunate. Any money we receive will be used to make life easier and enjoyable for all of us challenged by NF. Phase II of the Just Ask Foundation Mission is about to take place. Reggie will begin traveling the city of Houston, the State of Texas, and the United States to raise awareness of neurofibromatosis. But before he travels a mile, there is one thing that he desperately needs: the means to get there. He needs a car. An SUV to be more specific. We are asking for help in raising funds to purchase a used SUV that we can use to be able to attend more functions. Share a link to our campaign on your Facebook, Twitter, Google +, Tumblr. Get your very own Just Ask! t-shirt. If you see Reggie out and about, just ask!